BakermanBrad tries out the recently transitioned open alpha for Dungeon Defenders II by Trendy Entertainment that combines the genres of tower defense and action RPG. Where Dungeon Defenders II really stands out from other tower defense games is in its looting and leveling systems, allowing players to outfit their heroes with relics, weapons, and armor which can be oriented towards improving heroes’ stats or improving defensive structures. Weapons and armors can even be enhanced by fusing them as one to create exceptionally strong gear. The Old One’s armies have invated Etheria and it’s up to you and your friends to push them back! Create a team of heroes to take into battle. Then freeze, burn, and electrocute enemies with your deadly defenses or jump into the action yourself to finish them off! Play by yourself or with up to three friends in 4-player online co-op! 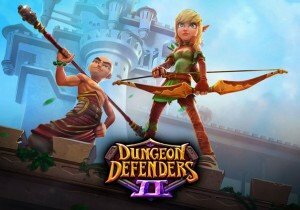 Dungeon Defenders II is now in open alpha (early access) on steam.